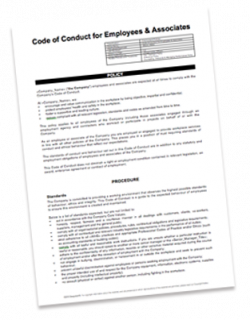 An Employee Code of Conduct is a written set of principals that clearly identifies expectations for appropriate behaviour. Without a documented Code of Conduct, your organisation is exposed to risk from bullying, harassment, discrimination and more. The typical cost of a case brought to a SME in these areas exceeds $50,000 in fines and lost productivity (not to mention damages to reputation). Remove your risk of bullying, harassment, discrimination and more. Don't operate for another day without your Employee Code of Conduct.